A very Merry Christmas treat by Acer Philippines to its loyal customers this Holiday Season. 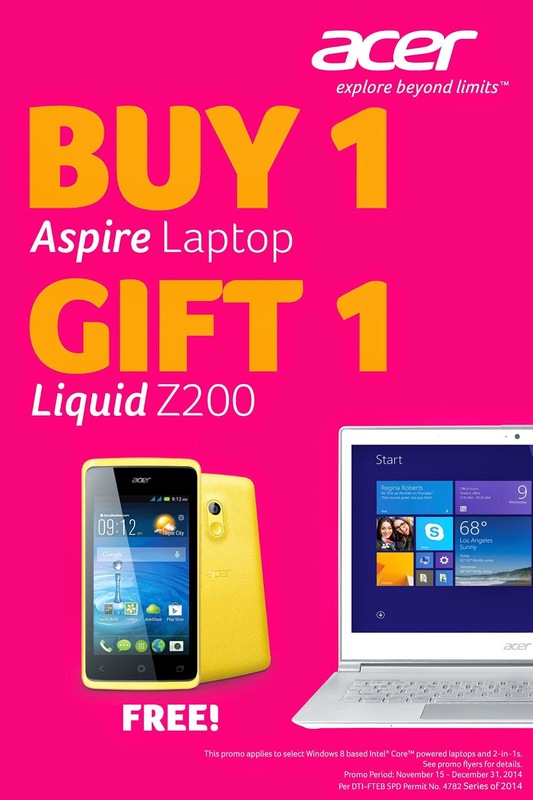 You get a Liquid Z200 Acer phone when you purchase an Acer Aspire Laptop. Starting November 15, 2014 up to December 31, 2014, customers simply need to buy any eligible Windows 8-based, Intel® Core™ -powered Acer laptops and 2-in-1 devices from any of the participating stores and get an Acer Liquid Z200 smartphone absolutely FREE! To claim the Acer Liquid Z200 smartphone, customers need to secure and fill out a copy of the “Buy 1 Gift 1” promo claim form and submit it along with the original copy of the Official Receipt, a cut-out of the product’s box Serial number, and two valid ID cards at the Acer Philippines, Inc. office located at the 9th floor, Fifth Avenue Building, 32nd Street corner 5th Avenue, Bonifacio Global City, Taguig City from Monday to Friday, 9 a.m. to 5 p.m.
Other redemption/availment areas are located at the Acer Service Centre – Manila, 1651 Paz Guazon Street, Paco, Manila; the Acer Service Center – Cebu City at the AMV Brothers Building, 9 F. Cabahug corner Almendras Streets, Mabolo, Cebu City, and at the Acer Service Centre- Davao City at the Ground Floor of Ateneo De Davao University, 8016 Roxas Avenue, Davao City. Claiming schedule at these locations are from Monday to Friday, 9 a.m. to 5 p.m. and Saturdays at 9 a.m. to 12 p.m. When claiming through email, customers only need to submit a clear scanned copy of the required documents and email to promos@acer.com or aphi.promos@acer.com, and follow up via (02) 815-33-88 local 100 and 125. The Acer Liquid Z200 Smartphone will be shipped directly to the registered address indicated in the submitted Buy 1 Gift 1 promo claim form. Per DTI-FTEB SPD Permit #4782 Series of 2014.